Because of its beauty and prominence from Wonder Lake, Mount Brooks (11,940’) has long been a focus of photography, art, and climbing activity. The peak holds an awesome position at the confluence of three of the major north side glaciers—the Muldrow, Traleika, and Brooks. The gentle North Ridge is the logical and most direct route. 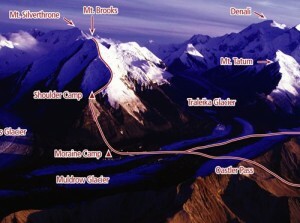 The climb makes for a great week-long trip that is a true Alaskan adventure, combining river crossings, tundra, mosquitoes, glaciers, and ultimately a spectacular summit.